Slate is waterproof and stain resistant but still subject to decline. Is your slate dull and dirty-looking? What about the color? Is it depressingly drab? We can help. Your slate, cleaned, enhanced, and sealed can look even better than the day it was installed. The technicians at Stone Makeover are trained in dealing with the quirks of slate. What causes slate to look dull over time? We're glad you asked. Heavy waxes, finishes, and soap residue can all give slate a lifeless, chalky appearance. 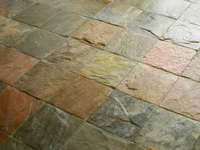 As with any other kind of natural stone, slate can chip, crack, and stain with time and use. These problems can all be resolved with proper restoration methods. Unlike other stone types, slate can be brittle, and as such, overly aggressive restoration methods can cause damage. It simply cannot be approached in the manner as other types of natural stone. Our experience with slate has resulted in proven methods of safely restoring, repairing and cleaning slate with stunning, satisfying results. When we remove what's on top of the stone (waxes, finishes, soap residues), the natural beauty of the stone underneath is revealed. While most slate is grey in color, there are natural variations containing green, yellow, brown, purple, blue and red hues. One of the best attributes of slate is how its color can be heightened with a color enhancer. The natural colors pop right off the surface, showcasing the character and charm of this unique stone. Stone Makeover can apply sealers that create the look you want, from a satin/matte finish to a wet-look finish. Sealers also help inhibit stains and make regular cleaning easier. We take pride in educating you on the proper care of your slate surfaces so that your slate can remain looking fantastic for years to come. Download our free Stone and Tile Care Guide for more information. Slate is a versatile stone. Consider blackboards, pool tables, or the beauty of the slate roofs that dot prestigious institutions and classic homes throughout the world. Inside the home, slate can be found as flooring, countertops, backsplashes, fireplace surrounds and wall cladding. The hardiness and durability of the stone means it holds up well against scratches and heat, with characteristics similar to granite. The uneven (cleft) surface of slate creates a rustic design statement, but it can also be honed smooth for a more modern appearance. For slate cleaning, stripping, enhancing, and sealing services throughout the New York and New Jersey areas, contact us online or call (800) 661-7866 today!